West Windsor, N.J. - The Athletics program will be in full swing with the addition of two teams to its Spring 2019 schedule. In addition to baseball, softball and men’s tennis, the Vikings men’s lacrosse team begins its inaugural intercollegiate season, while women’s tennis has moved to spring competition after competing in the fall for many years. 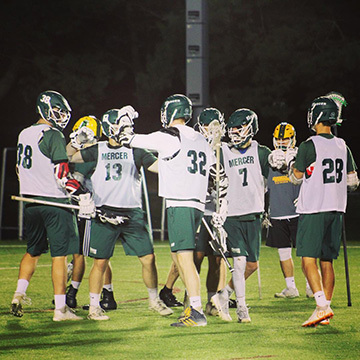 The men’s lacrosse team has been building to this point for the past year, beginning with the appointment of Head Coach Rob Siris, followed by athlete recruitment. Spring 2018 was the team’s practice season ahead of the full-fledged 2019 campaign. Siris is highly satisfied with the culture he and his athletes have built over the past year. As many as 30 players have practiced with the Vikings over the past year and team spirit is strong. With practice beginning on Jan. 22, Siris identified his team’s strengths heading into the season. “I think we have a strong group of goalies that have really been competing to get better. Then, on the defensive end, we have a strong leader in Vinnie Crea,” Siris said. Crea joined MCCC from The Gunnery school in Washington, Connecticut, where he recovered 53 ground balls as a senior in 2018. His defensive efforts will be augmented by Mercer’s offense, led by Brady Moore. Moore joins Mercer a two-time All American at Hopewell Valley and the Trenton Times area lacrosse player of the year in 2015. Most importantly, Siris looks forward to preparing his players to matriculate into other college and university teams. “What excites me most is being able to get guys, who otherwise wouldn’t be able to play lacrosse, engaged at MCCC and help move them forward to transfer to four-year schools,” he said. The lacrosse team opens the season on the road, with a scrimmage against Drew University in February. The Vikings’ first home game is on Feb. 23 against Finger Lakes Community College at 3pm. Siris is assisted by Nick Shriver and Matt Serfass. Assistant Coach Murf Butler also joins MCCC as an All-Defensive awardee from Hopewell Valley and former lacrosse team captain at the University of Mississippi. The Mercer Vikings during the 2018 practice season.